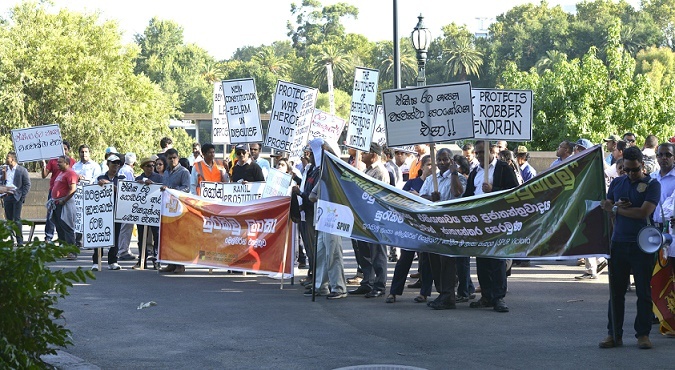 About 300 Sri Lankan expatriates gathered in Melbourne to protest against Prime Minister of Sri Lanka Mr. Ranil Wickremasinghe who was visiting Melbourne yesterday. The demonstrators paraded their solidarity to protect Sri Lanka from the most dangerous and unpopular path taken by the Prime Minister recently by prosecuting soldiers involved in eradication of Tamil terrorism in Sri Lanka. අග‍්‍රාමාත්‍ය රනිල් වික‍්‍රමසිංහ මහතාගේ ඕස්ටේ‍්‍රලියානු සංචාරයේ දී එරට ප‍්‍රමුඛ පෙලේ විශ්ව විද්‍යාලයකින් පිරිනැමූ ආචාර්ය උපාධිය අවලංගු කරන ලෙස ඉල්ලා සිංහල සහ දෙමළ ඩයස්ෆෝරා සමාජිකයින් පිරිසක් මෙල්බන් නුවර දී අද පස්වරුවේ විරෝධතාවක නිරත වුණා. ඒ, දේශනයක් පැවැත්වීම සඳහා අග‍්‍රාමාත්‍ය රනිල් වික‍්‍රමසිංහ මහතා මෙල්බන් නුවර ෆෙඩරල් චතුරස‍්‍රය වෙත පැමිණි අවස්ථාවේදියි. Jayawewa! Get this Australian version of Mervyn Silva out of Sri Lankan politics. The Doctorate I am sure was a present from the Indian Empire’s one of the academic outposts down under. The grant of the Doctorate looked a joke, with the receiver the Prime Minister of Sri Lanka Ranil Wickramasinghe dressed like a clown in a colourful gown which made him look like a circus clown. And PM Ranil Wickramasinghe’s wife standing by his side wearing some thing that looked like a saree but put arround her in a strange style. was the university playing a joke on him ? It is beautiful. I miss those activities after war was won. Keep up the good work friends. (Traitor Chief, Die Hard Catholic, Token Buddhist, Batalande Wadakaya, Mega Thief, Mega Liar, Pahara Dog). Beautify ? when both LTTE and Sinhalas get together to protest the joker ? 2017 පෙබරවාරි මස 17 10:43:35 | . ඕස්ට්‍රේලියාවේ නිල සංචාරයක නිරත අගමැති රනිල් වික්‍රමසිංහ මහතාට එරටදී පිරිනැමුණු ආචාර්ය උපාධිය අවලංගු කරන ලෙස ඉල්ලා දෙමළ ඩයස්පෝරා සාමාජිකයෝ මෙල්බර්න් නුවර දී බ්‍රහස්පතින්දා (16) විරෝධයක යෙදුණහ. ඩීකින් සරසවියේ නීති පාසල සංවිධානය කරතිබූ 2017 වාර්ෂික දේශනය පැවැත්වීමට අගමැතිවරයා මෙල්බර්න් නුවර ෆෙඩරල් චතුරශ්‍රයට පැමිණි අවස්ථාවේ එහි ඩීකන්එජ් ශාලාව අභියස දෙමළ ඩයස්පෝරා සාමාජිකයෝ කොටි කොඩි ප්‍රදර්ශනය කරමින් විරෝධය පෑහ. එම විරෝධතා මැද අගමැතිවරයා විද්‍යාර්ථීන් 700කට අධික සංඛ්‍යාවකගේ සහභාගිත්වයෙන් එම දේශනය පැවැත්වීය. ඔස්‌ටේ්‍රලියාවේ ස්‌පර් සංවිධානය සහ සුරකිමු ලංකා එකමුතුව ඉකුත් පෙබරවාරි 16 දා ඔස්‌ටේ්‍රලියාවේ මෙල්බර්න් නුවරදී උද්ඝෝෂණ ව්‍යාපාරයක්‌ සිදුකළේ වත්මන් රජයේ යෝජිත ව්‍යවස්‌ථාවට සහ මහ බැංකු බැඳුම්කර මංකොල්ලය ඇතුළු කරුණුවලට විරෝධය දැක්‌වීමට යෑයි එම සංවිධානය පවසයි. ඒ සම්බන්ධයෙන් කරුණු පැහැදිලි කරන ඔස්‌ටේ්‍රලියාවේ ස්‌පර් සහ සුරකිමු ලංකා එකමුතුව යන සංවිධාන නිකුත් කළ නිවේදනයේ මෙසේ සඳහන් වේ. අගමැති රනිල් වික්‍රමසිංහ මහතාට ඔස්‌ටේ්‍රලියාවේදී පිරිනැමුණු ආචාර්ය උපාධිය අවලංගු කරන ලෙස ඉල්ලමින් සිංහල සහ දෙමළ ඩයස්‌පෝරා සාමාජිකයන් පිරිසක්‌ මෙල්බන් නුවර ඉකුත් 16 වැනි දා විරෝධතා ව්‍යාපාරයක නිරත වී තිබේ යනුවෙන් එම පුවත්පතේ ඉකුත් 18 දින පළ වී තිබේ. ඔස්‌ටේ්‍රලියාවේ මෙල්බන්හිදී 16 දා අප සංවිධානය සහ සුරකිමු ලංකා එකමුතුව මගින් නිරත වූ විරෝධතාවය වූයේ ජනමතය පාගා දමමින් යෝජිත ව්‍යවස්‌ථාව මගින් පෙඩරල් හෙවත් සන්ධීය රාජ්‍යයක්‌ කිරීම,’එට්‌කා’ ගිවිසුම, බැංකු කොල්ලය, ජාතික දේපළ විකිණීම වැනි රට හා ජාතියට අහිතකර ක්‍රියාදාමයන්ට බැව් සඳහන් කරමු. එදින පැවැත් වූ අප විරෝධතා තුළ ”රනිල්ට දුන් ආචාර්ය උපාධිය අවලංගු= කරන්න’ යනුවෙන් කිසිදු විරෝධතා පුqවරුවක්‌, සටහනක්‌ හෝ ප්‍රකාශයක්‌ සිදුනොවූ බැව් ඉතා වගකීමෙන් යුතුව ප්‍රකාශ කරමු. Dear Randheniyage. The maximum capacity of the hall is about 450. See the above www site. It was all invitees only talk. Most of the invitees were whose who of Indian terrorist arms LTTE and JVP. The head of the Law Faculty is a High Caste Indian vermin from Manchester. It was an Indian job.